08/24/2015 – The APWU and USPS agreed on a Memorandum of Understanding re: Commercial Driver’s License (CDL) Training for Automotive Mechanics and Technicians on Aug 18, Motor Vehicle Service Craft Director Michael O. Foster has announced. The dispute arose in 2001, when the Postal Service unilaterally waived the requirement that Vehicle Maintenance Facility mechanics and technicians had to meet the minimum requirements for the position and possess CDLs when they were hired; the waiver continued for 89 days after the employees were hired, and employees would be terminated if they did not obtain their CDL by the end of their probationary period. “The APWU filed a dispute because we felt the waiver program could have been improved upon,” Foster explained. The issued was appealed to arbitration in 2002. 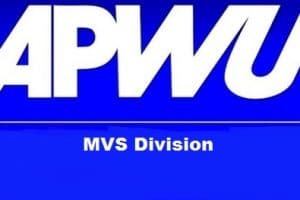 “Ten years later the parties began seriously discussing settlements that would enhance the Postal Service’s ability to recruit and retain qualified mechanics and technicians – which is certainly in the best interest of the APWU, and MVS Craft. It also will help achieve the goal of having enough qualified personnel to reduce the VMF subcontracting,” he said. Employees may be hired into duty assignments that require CDLs prior to obtaining a CDL. The Postal Service will provide on-the-clock training and the equipment for the CDL licensing test. The expectation is that the training and road testing can be accomplished in the first 89 days of employment. Under certain conditions, employees who do not acquire a CDL within their 89-day probationary period may be retained, as long as no other contractual provisions are violated. “The intent of the MOU is that employees who are hired into facilities or duty assignments that require CDLs will obtain them and perform those duties, which will protect senior mechanics and technicians,” Foster said. The parties agreed that the MOU does not constitute a waiver regarding the general requirement that applicants for Motor Vehicle Craft positions must meet the minimum qualifications. This entry was posted in General Union Business, Motor Vehicle Service and tagged CDL, CDL Training, Commercial Driver’s License, DIE, Driver Instructor Examiner, Michael O. Foster, Motor Vehicle Service, MVS Craft, reduce subcontracting, training, Vehicle Maintenance Facility. Bookmark the permalink.